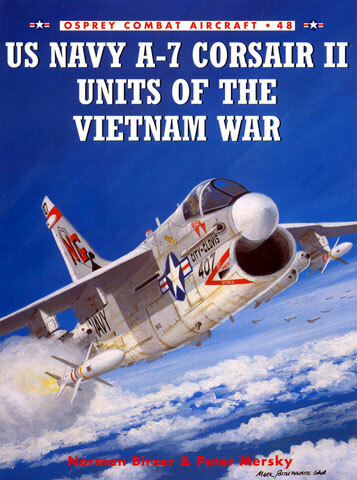 US Navy A-7 Corsair II Units of the Vietnam War is the latest addition to the Combat Aircraft series from Osprey Publishing. The book is co-authored by Norman Birzer (who actually flew the A-7 in combat in Vietnam and Peter Mersky a well respected and accomplished author on the subject US Naval aviation. Colour profiles are by Jim Laurier. Given the stellar credentials of the authors, this book does not disappoint. 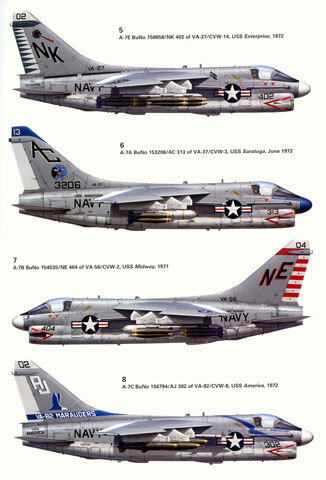 In summary, the book covers the employment of the Ling-Tempco-Vought Corsair II in the South East Asian theatre from its first deployment with CVW-2's VFA-147 aboard the USS Ranger in December 1967 to its last combat sorties with CVW-15's A-7 squadrons covering the joint US Marine/USAF operation to re-take the captured cargo ship, the SS Mayaguez in May of 1975…….and everything in between! The book comprises five chapters, a preface, an introduction as well as two appendices and nine pages of colour profiles. The Preface sets the tone for the entire book. It is a re-play of an operation the A-7 was designed for, an air-to-ground sortie with three VFA-147 Argonauts aircraft attacking enemy ground forces in close contact with friendly troops under the direction of a USAF Forward Air Control (FAC) flying an OV-10 Bronco. The Introduction advises on the birth of the A-7 into the world of close-air-support and its evolution of the A-7. The A-7 comes into its own. Last missions and the ceasefire. Operational histories are normally dry and require concentration as well as determination to get through. This is definitely not the case with this one. It has been written in an informative and interesting style that mixes the dry "who did what and when where" with first hand accounts of both the combat aspect as well as the developmental and maintenance issues that faced A-7 squadrons in this time – remember that this was a brand new aircraft at the time. Squadron deployments from 1967 to 1975. Combat losses by Bureau number (includes the pilot and his fate). Operational losses (in the same format). Captions to the colour profiles. A bibliography and index complete the section. If you are looking for walk-around type references to assist you with you’re A-7 build then look elsewhere. The book is however valuable to the modeller. One of the little snippets contained within its pages explains why A-7 photographs rarely show powder stains to the nose mounted 20mm cannons as they were cleaned off as soon as the aircraft returned from a sortie because the cordite was corrosive to the airframe – the last thing you want on a carrier based machine. As a fan of US Naval aviation, this is certainly one of the best books I have ever read on the A-7 and its employment in the Attack community.